Retrieves the current weather conditions for about 2,500 locations across the United States and US Territories. Auto downloads the current weather conditions 15 minutes past every hour while running. 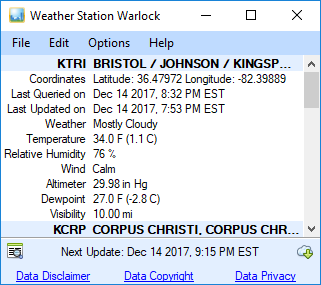 Auto downloads the current weather conditions upon program startup. Built-in station finder where you can select multiple stations to add. Built-in station finder includes search by state or search by partial/full string of station name/id. Copying of selected/all data to the clipboard.